Home / Music / Music: Captivating APAP! How It’s New York: The annual Association of Presenters and Performers Conference takes place at the Hilton in NYC. How It’s Irish: Culture Ireland has been sending over a delegation of performers and presenters and having a booth every year. On top of that, there are Irish musicians sent by other agencies performing, and people come from all over to scout. “More feet.” That’s not something you hear every day. Of Quebecois and Irish music, meeting Ciarán Hinds without realizing it, and an exhausting, exhilerating event. Jean-Olivier is sitting next to me. I know this, because his laptop is showing up on my bluetooth on my iPad as not paired. There are people next to me speaking French; someone is tuning up onstage, and people with instrument cases keep walking by the large glass windows of the Hilton lobby bar. I’m eating a soggy turkey sandwich, drinking mild coffee, and a performer has just put down a few postcards for her band. Did I mention that this is awesome? The fiddler is now really wailing double stops and bluegrass– and he’s clearly still tuning as the band take seats next to him. “More feet,” fiddler André Brunet keeps pleading with the sound engineer. That’s not something you hear every day but the sound of the tapping feet of the fiddler and the bouzouki player as they stamp on boards while the pay is the percussion of the band. I wrote this during APAP weekend in New York, the Association of Presenters and Performers conference. Artists, agents and festival presenters and promoters have come from all over the world to network, perform in showcases (some are short and at the hotel, some are full events held offsite that are open to the public). It’s overwhelming, exhausting, and completely exhilarating. Earlier, I had befriended Imani Uzuri, a vocalist-composer who gave Stephanie Pereira, who founded Kickstarter, the wildly successful crowd-sourcing program that has enabled independent artists (including many on the Irish scene) to complete their albums, a hug. Kickstarter was also responsible for Catskills Irish Arts Week going forward this year. Serendipitous connections like this are what APAP, the Association of Performing Arts Presenters, conference, is all about. It turns out the band was De Temps Antan, a Celtic Canadian band and one I really wanted to see. I got to see them later, or some of them anyway, because the session on Sunday night at 11th Street included a Quebecois splinter session in the back. Here is my report on some of the highlights of an amazing week. The APAP conference took place at the Hilton Hotel, its annual location, from Friday, January 11, through Tuesday, January 15. As I did with the Celtic Colours Festival in Cape Breton, I’ll be following this overview with other pieces, including concert reports and CD reviews. Concert reviews, and loads more photos, after the jump! APAP involved panels and plenary session on the arts, inspiring to all who attend (this year I managed two, and yep, found myself inspired and even exhilarated); as well as short showcase sets performed at the hotel and at venues around town to entice bookers and presenters – and also introduce the performers to the media. The expo hall has floors of booths from artists and presenters. I collected a lot of literature and CDs, and though I thought I had enough business cards with me, I ran out of them halfway through. That’s not just good copywriting. In this case there’s truth in advertising, because that’s exactly what happens. I felt re-charged, and I’m not even one of the hard-working artists. I discovered new talent. I gained professional know-how, networked with colleagues and learned about business and performance. Next year we may need two delegates because I couldn’t clone myself and there is just so much more to find out.Making the weekend especially fabulous is that Culture Ireland sends a delegation, some of whom are performing, and some of whom are here in town to network and just be. So I saw some wonderful musicians, as well as meeting up with friends, including Fishamble Theatre’s Jim Culleton, Talltales Theatre’s Deirdre Kinahan, and many more. Consul General Noel Kilkenny and his wife Hanora O’Dea Kilkenny had a reception at the residence on Sunday afternoon that was packed with APAP delegates and arts folks from all over, including WGBH Boston’s Brian O’Donovan. APAP brings everyone. Brian told me that this was his first APAP, and it was brilliant – he’ll be back. One thing you can expect not to do during APAP is sleep, much. At least this year I didn’t have a cold (I remember frantically trying to find an open CVS a few years ago before an event), but I did have a headache which never quite went away. Thankfully, Bally-O Promotion’s Tracy Crawford was in the same boat, and shared some paracetamol with me, which seemed much more effective than anything I had. 1. Attended part of the Saturday plenary, the Pecha Kucha (pronounced pshaw ke-sha), “You May Say I’m a Dreamer.” The Future of Music Coalition’s Jean Cook moderated a panel made up of composer and violinist Daniel Bernard Roumain, playwright Young Jean Lee, Kickstarter’s Stephanie Pereira, Algerian-born singer and activist Souad Massi and young arts “projectician” Adam Horowitz. 2. Found righteous indignation and renewed commitment to the idea that arts matter in the panel “Cultural Democracy and Community Curation.” While the panel was presented by Women of Color in the Arts, it was in no way a panel about presenting more work by women or by women of color. In fact, Baraka Sele, an independent producer and consultant in Montclair, NJ, who formerly was a programmer at NJPAC, went on a little rant about the misue of the word “diversity.” Other speakers on the panel included Kaisha Johnson, of the Center for Traditional Music and Dance; Monique Martin, director of family programming at CityParks Foundation, and Kathryn Garcia of Miami Dade College. Baraka Sele said that she did not believe democracy actually exists in this county. “It is incumbent on arts producers to bring back democracy,” Sele said. Kaisha Johnson talked about the shifting demographics in this country. Looking at the distinctions between high art, fine art, and folk art, Johnson said that culture was more than art. “It is bringing everyone to the table,” Johnson said. Her group has worked with the Ukrainian Mexican, and yes, the Irish community in New York City, among others. When people won’t come to her table, she brings the table to them, she said. When the panel were done, many people in the room had questions. Hassan Mahamdallie, senior strategy officer of the Arts Council in England, stood and spoke about taking inspiration from movements like the Harlem Renaissance, and that the disctinctions between high art and low art were false. “Igor Stravinsky visited Harlem,” Mahamdallie said. “This is not a marginal conversation. It is THE conversation.” And yet, the conversation was held in the basement (as were, in fairness, many other panels). Hopefully this is a conversation that will continue and take center stage. 3. I attended a reception at the home of Georgeanne Aldrich Heller for Conor Lovett and Gare St. Lazare Players. Conor Lovett is in my view the best interpreter of Samuel Beckett alive, especially as directed by his wife Judy Hegarty. I reviewed him in Title and Deed here last year, and in the company’s adaptation of Beckett’s First Love for Back Stage a few years ago. Now Signature Theatre, the company that specializes in doing whole seasons of a single author, is proposing doing Beckett in New York 2013. That would be an incredible gift to New Yorkers and to everyone on the East Coast who should drive in to see it. Spotted at the small party were Signature Theatre’s Executive Director Erika Mallin, Fishamble Theatre’s Jim Culleton, Irish Arts Center’s Aidan Connolly, the author Barbara Hammond, and the actor Ciarán Hinds. 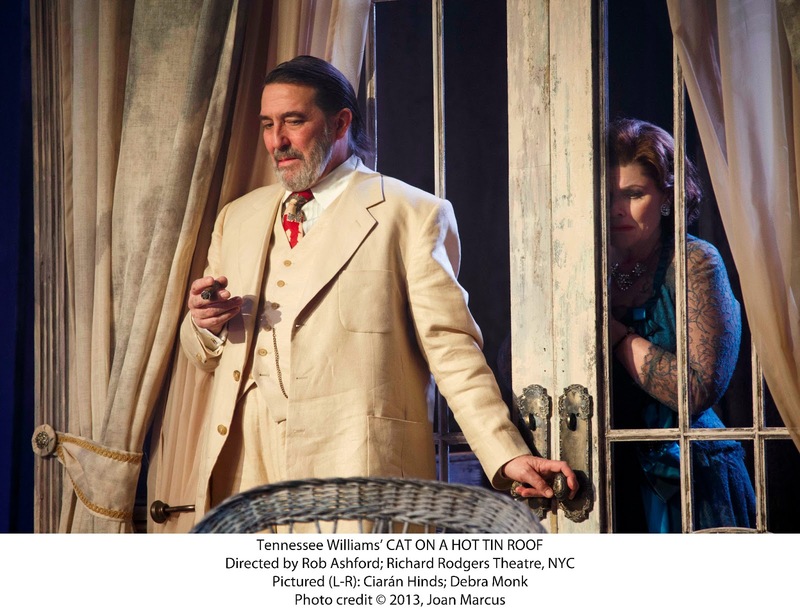 I didn’t realize it was Ciarán Hinds when I met him, although we shared the elevator together and he said his name was Ciarán and he was an actor and even that he was in Cat on a Hot Tin Roof (he’s playing the major role of Big Daddy in the play by Tennessee Williams). Ciarán was in Saturday clothes, and very low-key, and I completely missed the chance to fawn on him and tell him how amazing he was in The Seafarer a few years ago (read my review here!) and in the film Eclipse, both by Conor McPherson. But I’m not surprised he’s a friend of Conor Lovett’s nor that he’d go out of his way to see him, because Conor is a rare actor, a total natural, and it makes sense that another great actor would value him. At the party Conor did a small excerpt from Molloy, one of Beckett’s short novels, and reminded us all of what we might be getting. 4. I rushed to a performance of Aedin Moloney’s Airswimming at Irish Rep, which I reviewed last week. 5. Then it was back to the Hilton for the showcase of Irish music, curated by Susan McKeown, whose concert highlighting her new CD Belong I wrote about two weeks ago. Four bands were in the showcase: Réalta, I Draw Slow, The Young Folk, The Spook of the Thirteenth Lock. I love the young Belfast band Réalta, who just released their first CD Open the Door for Three. It’s an unusual group in that there are two pipers: Conor Lam and Aaron O’Hagan (formerly of Craobh Rua). Deirdre Galway plays guitar, bouzouki and sings. She has an untrained, natural voice that seemed a little strained at the showcase but on the CD has a fresh charm. The band play fast and skillfully and I found them a joy. The Young Folk are a blend of pop, rock and traditional instruments, made up of Anthoney Furey on vocals and guitar, Paul Butler on keyboards, Karl Hand on drums, Tony McLoughlin on bass, and Karen Hickey on violin and flute. The melodies have a certain Cranberry pop appeal, but for me they became repetitive, and the lyrics while simple and honest verge on being too simple. The repetition of “yeah, anymore,” for example, doesn’t gain meaning when you’ve heard it five times. I did like the xylophone, and there is potential but for me it does not yet gel. I Draw Slow are an Irish band who play Appalachian music, and do it with immense style and flair. They even were partially costumed onstage. The group is fronted by a brother-sister team, Dave and Louise Holden, on guitar and vocals, joined by Konrad Liddy on upright bass, Colin Derham on banjo and Adrian Hart on fiddle. The fiddle to me was particularly impressive. Their YouTube of their song “Goldmine” brought them to the attention of American festivals and they’ll be here in 2013. Something is definitely going on with this Irish-Appalachian crossover-Mick Moloney will again be holding an extravaganza at Symphony Space on the subject in March. Stay tuned, and stay tuned for I Draw Slow. I wish I could say the same for five-piece Dublin band The Spook of the Thirteenth Lock, an Irish rock band who took their name from a poen about a haunted canal lock. They are, as Susan said they were, working in a tradition of Irish rebel bands, but to me, it was kind of like “music to fire up a bong to.” I can picture a long rap session while their music plays in the background. Long riffs, even without the electric guitars, had a trancey feel, and a kind of early Fairport Convention sound. I can see that they’d click with a lot of people, just not for me. 6. On Sunday, I went to the Expo Hall and introduced myself to many music and theatre agents, and collected many CDs… watch for reviews! 7. Then it was off to the reception at the residence of the Consul General, where in addition to seeing many friends, including publicist Anita Daly and writer Kathy Callahan, Origin Theatre’s George Heslin, as well as Deirdre Kinahan and her brother Hugh Healy, I also had the opportunity to see the production of composer George Higg’s Door. A musical door is embeded with many different instruments, played by Sean Carpio and Kate Ellis. During APAP they played the door throughout the East Village and at tne Museum of Modern Art. The production took place on the balcony of the residence, but the music was so startling and compelling, with Indian overtones, and the presentation of the musical door so unusual, that everyone stood shivering on the balcony until it finished. 8. Following a much-needed dinner break (while others rushed off to see cabaret art-singer Jack Lukeman), I returned to the Hilton to see a few more showcases, including Colcannon and Cherish the Ladies. First, though, I had a meeting with Tracy Crawford, who filled me in on the amazing things planned for Ennis, where she and her husband, Lúnasa flutist (and genius) Kevin Crawford (see our InteReview of his album Carrying the Tune here). Tracy is planning an Ennis Roots Weekend as part of The Gathering. Among the things planned are breaking the Guinness World Record attempt for the largest tin whistle ensemble, and Tracy is asking everyone to learn it from a YouTube video of a tune. Tracy said she is learning it, and said I must do the same. I think there might be a pennywhistle on the piano somewhere. Save the dates: June 21 – 23. Cherish put on an amazing set, with their dancers, including the whippet sharp Joe Dwyer. Caitlin Warbelow, who teaches advanced fiddle at Irish Arts Center and can often be found at O’Neill’s on a Sunday night (she even did an album, Manhattan Island Sessions, that was recorded at sessions around town, including O’Neill’s), played with them during APAP, and beautiful singer Cathie Ryan joined them. We reviewed Cathie’s concert debuting her lovely CD Through Wind and Rain a few months back. I’d seen Caladh Nua just once before and was not prepared to be quite so bowled over by them. They were in one of the best rooms in the hotel for bands – the Mercury Ballroom has a proper stage, and Baylin Artists Management had put out chocolates and seltzer for those watching, a very welcome touch. While not so chatty and warm as Cherish’s Joanie Madden (let’s face it, who is? ), the band, consisting of Eoin O’Meachair (Banjo and Mandolin, Whistles), Lisa Butler (Lead Vocals and Fiddle), Paddy Tutty (Fiddle, Bodhran), Derek Morrissey (Button Accordion) and Colm O’Caoimh (Guitar) were very very good. What stood out for me and what I won’t soon forget is Colm O’Caoimh’s rendition of Richard Thompson’s “Beeswing,” a haunting lovesong to a roving woman, a song based on the idea of Annie Briggs. The idea, not the real person, because Thompson has admitted that he only met her a few times and both times, true to her reputation, she was passed out drunk. Colm has a gorgeous voice and plays a wonderful guitar. If he’d only stand up straight. “She was a rare thing… she was a bee’s wing… so fine a breath of wind would blow her away..” makes the song’s punch a knock-out blow. It’s on their first album, Happy Days. I’d like to see more of them and will review their latest CD soon. There was as there always is a late night session at the 11th Street Bar where it seemed as though the whole delegation, and many local players, turned up. It was hard to get in the door. I was a little disappointed more of the visitors didn’t play – Alan Kelly of the Alan Kelly Gang, and flutist Steph Geremia (I saw them at Celtic Colours in October, and reviewed their CD), played with Tony DeMarco, as did Dervish’s Brian Mc Donagh, Dan Gurney and a few others, but I’d have liked to see the youngsters from Réalta and I Draw Slow join in. There wasn’t much room for them to do it, of course. It was so crowded that sean-nos dancer Siobhan Butler literally danced on the table. Whether you play or not, the session during APAP weekend is entirely unmissable. I had to go to work the next day, so left at only 2:30am. I heard from Tracy Crawford, who was dancing with the Quebecois contingent at the back, that she got home at 5:30am. I loved a story that Conor Lamb of Realta told me that one of the musicians in The Young Folk is “sick” from his job as a teacher, and had to disable Facebook for the weekend in case somebody tagged him in a photo. He was to go straight from the airport to school, and it would work well, said Conor, because he’d look so wrecked he’d look as though he had been sick. Yeah, APAP is that great a party it’s worth risking your health. And your money.